Bellevue is fortunate to have so many buildings that are among the oldest in Nebraska and listed on the National Register of Historic Places. In previous weeks we discussed the Log Cabin and the Fontenelle Bank, this week we will focus on two more- the Hamilton House and the Old First Presbyterian Church. The Hamilton House, located at 2003 Bluff Street, is made out of stone with walls measuring nearly 2 feet thick in places.The home originally featured a central hall with a black walnut staircase, two bedrooms, dining room, and what we now call a living room. It was constructed in 1856 for the Reverend Hamilton, who was in charge of the Otoe and Omaha Indian Presbytery Mission. 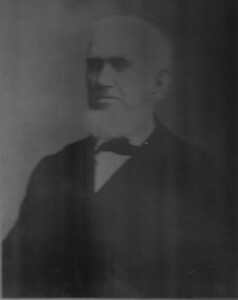 Reverend Hamilton oversaw the construction of what is now known as the Old First Presbyterian Church and served as its minister for numerous years. 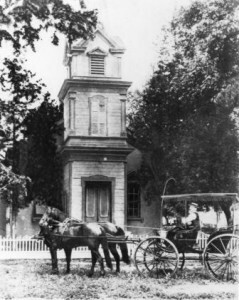 The Reverend resided in the house until 1867. Over the years the Hamilton House has undergone several changes. The front door was originally on what is now the backside of the house and supposedly featured pillar columns and a double deck. A screened sleeping porch was added by a later resident who suffered from tuberculosis. 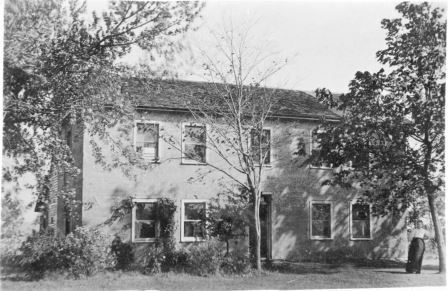 About 1930, electricity, plumbing, and a garage were added. In 1941, the Harry B. Patrick family purchased the property. The Patrick family restored the property, keeping the original room partitions of a dining room and what we now call a living room on the first floor with two large bedrooms upstairs. According to a local newspapers, the couple repaired the stucco, restored rooms to their original use, added a third bedroom over the summer kitchen, expanded to the garage, and added closets to the bedrooms. The couple also extensively furnished the house with antiques. The home is still owned by members of the Patrick family and is not open to the public. The Old First Presbyterian Church is located at 2002 Franklin Street. Construction of the church began in 1856 and by 1858 it was ready for services. The congregation previously met at the old Mission House and flourished under the care of Reverends Edward McKinney and William Hamilton. Over the years, several small additions were made to the church with perhaps the most noticeable being the vestibule and spire in 1870 and stained glass windows in 1905. In 1959, the growing congregation was forced to relocate. Mrs. Harold LeMar, the same local preservationist who saved the Fontenelle Bank, bought the property and worked to have it placed upon the National Register of Historic Places. The City of Bellevue purchased the property in the 1970s and restored the building. For a tour of the Old First Presbyterian Church, contact the museum at (402) 292-1880. If you would like to book the church for a wedding, contact the City of Bellevue at (402) 293-3142.